To cater the single phase loads from the 3-Phase inverters, all inverter designers will use the system neutral which is used for the load distribution as well will be used as reference in order to develop the sinusoidal output phase waveform. So, every manufacturer uses different techniques depending upon the technology. But, whatever may be the technology the manufacturer uses, he has to take the neutral (which is the return path for the single phase loads) as reference. Sometimes or many plants, the neutral is also earthed. Hence, that earth is being brought to the UPS panel and hence the UPS earthing/grounding is very important. The analog control and regulatory circuits will not function properly without the reference. Thumb rule of electronic circuitry is the voltage produced at what reference and which reference. In general, this reference is either panel earth or the system neutral. Eventually, system neutral shall also be brought to the UPS panel either from the input side or the output side. However, the standard international nomenclature is to bring the neutral from the output side. Unlike variable frequency drives which works only on 3-phase and neutral is not a question or the 1-phase load is not concerned since the motor load is almost balanced. 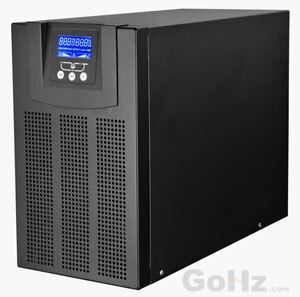 But, in case of UPS, the load can be either 1-phase or 3-phase and the total loading need not to be balanced. Hence the reference is very important which is most of the cases either neutral or the earth depending upon the manufacturer design. During my power quality audit work, I had incurred a strange problem. The said UPS was taking power from 3 phase 3 wire input. Output needed was 3 phase - 4 wire. Additionally, an isolation transformer was used in the said UPS and user manual specifically mentioned about output of such UPS - Neutral should be solidly earthed/ grounded. The voltage fluctuation was observed at output of UPS and this problem was detected as in-appropriate earthing of output Neutral connection. With appropriate earthing of neutral, the problem was resolved. The mains transformer neutral and earthing at UPS point, the potential difference observed after rectification as 3.5 to 7Volts AC. (the distance between supply transformer and UPS system was quite large). The medical equipment (for laboratory analysis) connected at output of UPS and with mains transformer neutral could not work with such neutral to earthing potential. Thus, the correct advice was to earth the neutral at the output of UPS isolation transformer. (Note isolation transformer was the part of UPS system and not supplied separately). The isolation transformer was Delta (i/p) and Star (o/p). Thus, one has to look at various configurations of UPS available and then resolve the issue as per different configurations of UPS.